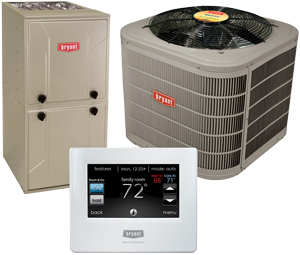 We service all types of HVAC systems! Andy's Heating & Air Conditioning Co., Inc.
Andy's Heating & Air creates healthier, more comfortable homes in Yuba City, CA and surrounding areas. Family owned and operated, we prioritize the cost and convenience of maintaining perfect indoor conditions. From heating and cooling, to air quality, we offer dependable services and effective products to improve your day to day life. Through a range of industry-leading options, including gas furnaces, air conditioners, ductless units, geothermal heat pumps, and more, Andy's Heating & Air turns any challenge into an enjoyable indoor environment. An expert for all your heating & cooling needs! As a Bryant Factory Authorized Dealer, our team is exceptionally trained and held to high standards of business practices, customer service, and technical expertise. Established in 1969, we’ve tailored our installation, maintenance, and repair services to deliver maximum return from your investment. Call Andy's Heating & Air today for top quality HVAC repairs, maintenance, and installations! Our full showroom allows you to step inside and get a firsthand look at cutting-edge products, speak with a knowledgeable and helpful member of our staff, and make informed decisions. We are happy to explain different options, familiarize you with operation, and answer any questions you might have. By targeting your specific requirements and expectations, we ensure heating, cooling, and air quality solutions that satisfy your goals for comfort, efficiency, and budget. And if you’re tackling a do-it-yourself project, we offer quality parts and helpful recommendations. Stop in and see us, or give us a call at (530) 755-2639 for a convenient appointment time. Andy's Heating & Air offers skilled and conscientious heating, cooling, and air quality design/installation, seasonal maintenance, and prompt repair throughout Yuba City & Marysville, CA. © 2019 Andy's Heating & Air Conditioning Co., Inc.